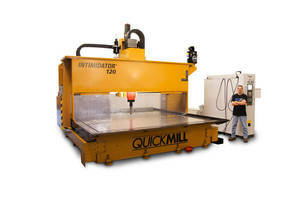 Tampa, Florida – Arthur Machinery-Florida represents Quickmill CNC Gantry machines, "more than just a machine". Quickmill headquarters and manufacturing in Peterborough, Ontario, Canada manufacturers a complete line of Gantry CNC Machining Centers. For over 30 years, Quickmill has installed machines in various industries such as Heat Exchanger, aerospace, power generation, energy, marine, Mold Die, steel service, Structural Steel, transportation and general job shops. Since 1997, the Quickmill name has become synonymous with exceptional value and performance. Across a wide variety of industries, Quickmill has developed a proven track record for reliable, innovative machining and drilling solutions. The Quickmill standard models, along with their complete turnkey systems , offer manufacturers proven reliability to suit their needs. In spite of their size, the machines are easy to install and do not have the need for reinforced foundations. Robert Arthur says this niche product definitely has applications in the Florida market. The Quickmill Gantry machines use the industry reliable Fanuc CNC controls.